Colombia will have to settle for second best in Latin America. President Juan Manuel Santos looks set to take the first step toward re-election on Sunday after helping to propel his country’s economic fortunes. Nevertheless, Colombia faces significant geographic, political and social constraints. That means Chile should retain its singular gold-plated status in the region. The cautious free-market policies pursued by Santos seem to be working. The budget deficit is projected to shrink from an already modest 2.4 percent of GDP last year. Meanwhile, output is on track to grow by 4.5 percent both this year and next, according to the IMF. Given the slow rate at which the country’s population is increasing, living standards should therefore rise markedly. The 3.5 percent policy interest rate also sits comfortably above the 2.7 percent inflation rate, giving Colombians a chance to save and helping prevent excessive borrowing. Investors have noticed. Since Santos took office in May 2010, the MSCI Colombia Index has gained 22 percent compared to just 2 percent for the broader Latin America index. And Moody’s upgraded the country’s debt into investment-grade territory. The rating agency maintains a positive outlook. Despite the admirable progress, Colombia may find it difficult to sustain at the sort of pace that would help it attain the elite status commanded by Chile. The Andean nation’s GDP per capita was 80 percent higher in 2012, according to the latest official figures available. Its debt is lower, its credit rating six notches higher and, according to Transparency International, it is perceived to be decidedly less corrupt. Structural factors may be hard to surmount for Colombia. Its terrain makes it difficult, even with today’s advanced technologies, to communicate. Slow but steady peace talks with FARC rebels are encouraging, but scars from a 50-year civil war linger close to the surface and remain at risk of flaring up. And while the homicide rate in Colombia has more than halved over the past decade to almost 31 per 100,000 residents, it is still higher than Brazil’s and Mexico’s – and 10 times that of Chile. For Santos, though, having firmly positioned his country as a regional runner-up may well secure his own victory. 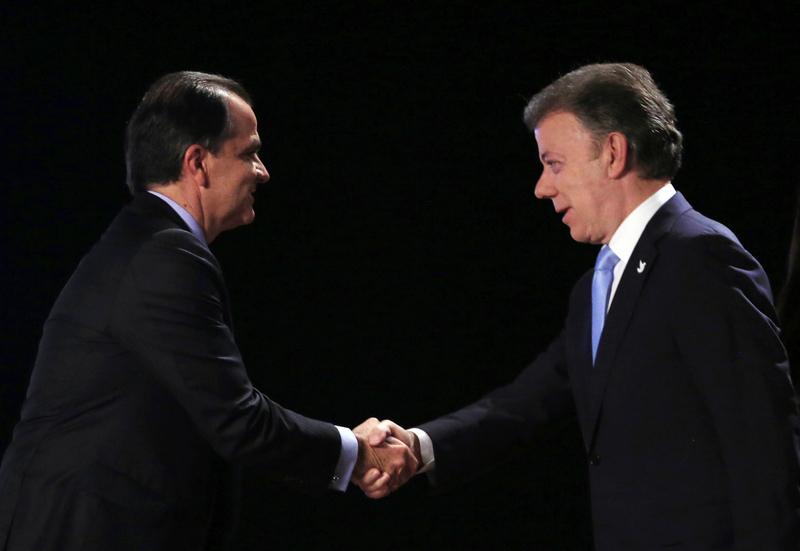 Colombia is slated to hold a presidential election on May 25. If no candidate receives 50 percent of the vote, a two-candidate runoff is scheduled for June 15. According to a recent poll, President Juan Manuel Santos is ahead with about 27 percent of the electorate compared to 19 percent for right-wing candidate Oscar Zuluaga and about 10 percent each for Enrique Peñalosa of the Green Alliance and Clara Lopez of the Alternative Democratic Pole. The intentional homicide rate in Colombia was 30.8 per 100,000 inhabitants in 2012, according to the United Nations Office on Drugs and Crime, down from 68.9 in 2002. That compares with 53.7 per 100,000 in Venezuela, 25.2 in Brazil, 21.5 in Mexico and 3.1 in Chile. Colombia’s GDP per capita at purchasing power parity was $11,900 in 2012; Chile’s was $21,500, according to World Bank data.